Many of us become more forgetful as we get older. Many will have 'mild cognitive impairment'. Some of us will begin to develop more serious problems and may worry that they are the first signs of dementia or Alzheimer’s disease. This webpage looks at some causes of poor memory, and how to find help if you are worried about your own memory or someone else’s. Many things can affect our memory and dementia may not be the problem. For instance, it is common to experience memory problems as a result of stress, depression, grief and vitamin deficiencies. Ask your doctor if you are worried about yourself or someone you know with memory problems. Dementia is a general term used to describe a loss of memory that keeps getting worse - or is 'progressive'. There can be many different causes, they will all involve loss of memory, but they have other symptoms which are different according to the cause. changes in mood, judgement or personality. As dementia is 'progressive', the symptoms get worse over time. Someone with dementia will become more dependent on others to help them as the illness progresses. Dementia is a common. It currently affects 850,000 people in the UK. 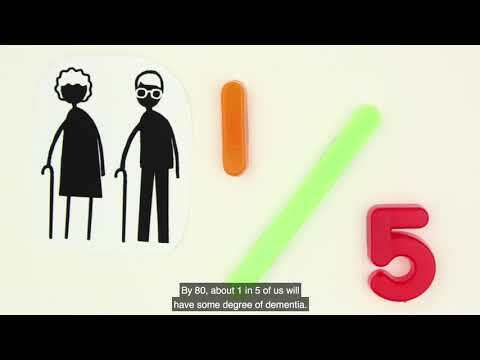 by the age of 80 about 20 people in every 100 will have some degree of dementia. Dementia can sometimes occur in younger people and may run in families, although this is rare. Sometimes people will have problems with their memory which the person may notice or which might be picked up by others. These problems may not significantly affect the person's everyday life and are not severe enough to be called dementia. This is called Mild Cognitive Impairment (MCI). Out of 100 people with MCI, about 10-15 people will develop dementia in any one year. We can't yet identify those people who will go on to develop dementia. There are different causes for dementia. This is the most common cause of dementia and accounts for about 7 in 10 of all dementias. they can't remember things that happened recently, even though they can still remember what happened years ago. They will often find that they have difficulty recalling particular words and naming objects. Sometimes they are not aware of their memory loss and the problem is noticed by others. Remember recent events, appointments or phone messages. Remember the names of people or places. This can lead to problems with even simple daily activities. Understand or communicate with others. Remember where they have put things. They may worry that someone has been in their house or has taken things. Understand that there is anything wrong with them. They may become cross when someone tries to help them. Carers often comment that people with Alzheimer’s show subtle changes to their personality. For example, they might behave or react differently to how they did before they became ill. In Alzheimer's, damaged tissue seems to build up in the brain to form deposits called 'plaques' and 'tangles'. These cause the brain cells around them to die. The disease also affects the chemicals in the brain which transmit messages from one cell to another. The chemical most affected is acetylcholine. This is usually caused by the blood vessels supplying the brain becoming damaged or blocked. This can lead to small strokes, or parts of the brain dying, as they are starved of oxygen and nutrients. This dementia can come on more quickly than Alzheimer’s. Someone with vascular dementia is more likely to suffer from conditions which lead to blocked arteries, such as high blood pressure, smoking, diabetes or high cholesterol. It is difficult to predict how vascular dementia will progress. There may be no further problems for months or years, but then more strokes, or other illnesses, can lead to further deterioration. The problems caused by vascular dementia depend on which part of the brain is affected. There may be memory loss and difficulty concentrating. Language difficulties are common - as they are in Alzheimer’s. It is common to suffer from mood swings or to feel depressed. Some people have episodes of confusion and may be aggressive or distressed. Others may experience hallucinations (where they see something that is not there). Sometimes there are physical problems, for example difficulties with walking or incontinence. hard, even for doctors, to tell the difference between them. A brain scan can sometimes help. This seems to be caused by protein deposits (Lewy bodies) building up in the brain. Memory problems and difficulty planning tasks. Confusion which can vary during the course of the day. Vivid visual hallucinations of people or animals. Trembling of hands, muscle stiffness, falls or difficulty with walking. This dementia seems to affect the front of the brain more than other areas. It often starts in people in their 50s and 60s. Because it affects the front of the brain, it is more likely to cause personality and behavioural changes. So a person who is usually very polite and proper might start to become irritable or rude. Memory can remain good for a long time. Dementias are diagnosed by the pattern of symptoms that a person has and the way in which these symptoms affect how people cope from day to day. So, the first step is an interview to look at the person's thinking and memory using 'cognitive testing'. This can help to identify problem areas and will often give clues as to the type of dementia. Blood tests and scans may be used to look for other reasons for these symptoms. Scans (CT/MRI scans) can help to identify the type of dementia and this can guide any treatment. Referral to a specialist ‘Memory Clinic’ is now common to help early diagnosis. The person may be seen by a range of professionals - psychiatrists, geriatricians, psychologists and nurses. Who is at risk from dementia? Any of us can develop a dementia - we all have to get older. But, some medical conditions can make it more likely that we will develop dementia. These include strokes, heart disease and high blood pressure. Poor diet and a lack of exercise may make these diseases more likely. Lifestyle can affect our risk. Smoking and drinking heavily make memory loss more rapid in old age. People who drink heavily as young adults and in middle age are more likely to develop an alcohol related dementia. Genes also play a part in dementia. In Alzheimer’s disease and Fronto-temporal dementia, some of these genes have been found. If a brother or sister or a parent has had Alzheimer’s disease after the age of 65, then your risk of developing dementia is twice that of the rest of the population. This does not mean that you will develop dementia - but there is no test (yet) which can predict this. In some families, members tend to develop ‘early onset dementia’, so there seems to be a stronger genetic cause in these cases. So, if there has been more than one person in your family with a dementia starting before the age of 65, it could be worthwhile seeking advice from a geneticist. This will depend on the diagnosis and your circumstances. Unfortunately, there are no cures for these conditions. It is important to help someone with dementia stay as independent and as mobile as possible, for as long as possible. A psychological treatment called group cognitive stimulation has been shown to help with memory and improve the quality of a person's life. Reminiscence Therapy involves the discussion of past activities, events and experiences with another person or group of people. This has been shown to have beneficial effects on both understanding and knowledge (cognition), and in reducing the strain on carers. A group of drugs called Acetylcholinesterase Inhibitors and another drug called Memantine that can treat some of the symptoms of Alzheimer's dementia, and help people to maintain their independence for longer. These drugs may also be helpful in Lewy Body Dementia, particularly if hallucinations are a problem. See our information on 'Drug treatment of Alzheimer's disease'. In Vascular dementia, it can be helpful to take a small dose of aspirin to prevent further strokes. Your GP may also suggest taking medication if you have high blood pressure or raised cholesterol. It is also helpful to stop smoking, eat healthily and take regular exercise. I have dementia - how can I help other people? There is lots of research happening, in the UK and around the world, into the causes of dementia and how to treat it. These organisations can be contacted directly or you can ask your GP or local mental health team what research is happening locally. Brains for Dementia Research was established in 2007 to promote brain donation and establish a network of brain banks to facilitate research into dementia. They invite people diagnosed with a memory impairment (or dementia) to participate in monitoring memory, thinking and behaviour prior to brain donation. They also invite those who do not have a memory impairment to take part, as normal brain tissue is essential for comparison. Use a diary to help you remember appointments. Keep your mind active by reading or doing crossword puzzles, Sudoku’s and other mind exercises. Stay involved and connected – find your local Memory Café. Eat a healthy diet (supplements such as Vitamin E and Ginkgo Biloba are not currently recommended). There may come a time when it is difficult to make decisions about important matters in your life, such as managing finances or medical decisions. You can give a trusted relative, friend or solicitor the right to make such decisions on your behalf if you cannot. This is called a Lasting Power of Attorney (LPA). A solicitor can help you arrange an LPA. There are 2 types of LPA - one for the management of ‘Property and Financial Affairs’, and another for matters involving ‘Health and Welfare’. Property and financial affairs LPA - Attorneys can be appointed to make decisions about such things as banking and investments, property sales, tax and benefits. Health and welfare LPAs - Attorneys can be appointed to make decisions about such things as medical treatment, day-to-day care and place of residence. All LPAs must be registered with the Office of the Public Guardian before they can be used. Note re: Enduring Power of Attorney (EPA): the LPA has now replaced the EPA. However, valid EPAs that were executed before 1 October 2007 will continue to be valid, even if they have not yet been registered. Advance Decisions - it is possible to make known decisions to refuse certain medical treatments in the future should you lose the capacity to make decisions. These will be respected by the professionals providing care. This can be made at the same time or separately from a LPA. For people with memory problems, it is important that professionals can easily see important information about them. ‘This is Me’ is a document that can be completed for this purpose. It has lots of useful information about people's medical history, their life and preferences. People with dementia commonly become depressed and anxious. But, it is also possible for depression to look like a dementia. Like dementia it will affect a person's ability to look after themselves. This is called ‘pseudo-dementia' and it is important to identify it and treat it. If you are concerned that you or a relative may be depressed, seek advice from your GP in the first instance. Depression can be treated with antidepressants and talking therapy. If you are worried about your memory, make an appointment to see your GP. They may do some simple tests to check your memory, and perhaps organise some blood tests. If needed, your doctor can refer you to a specialist team, a psychologist or a specialist doctor. These people can carry out more detailed tests and arrange a brain scan if needed. Some areas have memory clinics where these assessments are carried out. Also see below for other organisations that can provide information and support. If you need help with practical activities and day-to-day care or benefits, you can contact your local authority for advice about social care and carer support services. If you are worried about your memory, make an appointment to see your GP. They may do some simple tests to check your memory, and perhaps organise some blood tests. If needed, your doctor can refer you to a specialist team, a psychologist or a specialist doctor. These people can carry out more detailed tests and arrange a brain scan if needed. NHS Choices: links to local services and information about dementia. National Helpline of advice and support: 0300 222 11 22. The National Dementia Helpline provides information, advice, and support through listening, guidance and appropriate signposting to anyone affected by dementia. Advice Line: 0808 808 7777. Carers UK supports carers who are providing unpaid care for friends or relatives. The Citizen’s Advice Bureau offer free, confidential and independent advice. Contact your local office for assistance with benefits, financial planning or organising care. A charity which funds research into Dementia with Lewy Bodies, provides support and information to help families and carers who need to understand the disease and its impact. The Law Society have lots of useful information about the legal issues involved in making a Power of Attorney or Advance Decisions and can be a useful resource for finding a solicitor to help. If you know or care for someone who is having difficulties making decisions about their personal health, finance or welfare, you may need to apply to the Court of Protection so that you (or someone else) can make decisions for them. An agency with responsibilities that extend across England and Wales (separate arrangements exist for Scotland and for Northern Ireland). It supports the Public Guardian in the registration of Enduring Powers of Attorney (EPA) and Lasting Powers of Attorney (LPA), and the supervision of deputies appointed by the Court of Protection. The Reading Well Books on Prescription scheme supports people with dementia and their carers. 25 titles on the booklist will be available in libraries across England from February 2015. They have been recommended by health experts and people with lived experience of dementia. The books can be recommended by health professionals or people can self-refer and borrow titles for free from their local library. The titles on the booklist are divided into four categories: information and advice; living well with dementia; support for relatives and carers; and personal stories. Alzheimer's and Other Dementias: answers at your fingertips. Cayton, Graham, & Warner. Class Publishing (London) Ltd. 3rd edition 2008. Your Memory: a users guide. Baddeley. Carlton Books (London). Revised edition 2004. Dancing with Dementia: My story of living positively with dementia. Bryden. Jessica Kingsley Publishers (London & Philadelphia). 2005.